This is the last of twenty-one lessons for design students, gathered from the combined experience of being a student, and teaching students. I’ve published one lesson each weekday for the last month and now they’re done. It is 2am in the morning. You are sitting in front of your computer screen, inspecting your SketchUp model with critical intensity. You measure each of the treads on your staircase to ensure they are even. You export your model once again to Artlantis and run a test render. It doesn’t look quite right. You alt-tab across to Photoshop and open your timber stair texture map. There are some inconsistencies in the grain that have been annoying you. You spend an hour zoomed in at 2000% rubber stamping them out of existence. Back to Artlantis again for another render. This time it’s perfect. It’s also 5am, so you fall into bed exhausted. Computer programmer Tom Cargill said in the 1980s, “The first 90% of the work accounts for 90% of the time. The remaining 10% accounts for the other 90% of the time.” If you are one of those rare students who arrives at the end of semester with time to spare, then you need not read on. Perhaps for you, a project that is both finished and perfect is within grasp. For the other 99% of the world, read on. Like coal and uranium, time is not a renewable resource. All the more-so when semester lasts just 12 weeks. Spending night after night as I’ve described above is a great way to never finish. The reason for this is simple: there is always something more that can be done. More adjustments to your design, more alternatives to explore, more lines to add to your plans, more renders to run, more work on your texture maps, more detail in your model. When I was a student and there was a week left of semester, I’d think I’d give anything for an extra day. Then when there was a day left, an extra hour. An hour left, just one more minute. If you’re anything like me, you will find yourself drawn to perfection at every step. You’ll think to yourself that if you can just get this bit right, you can move onto the next stage. But what you can’t see, what nobody can see when they’re deep in the zone, is what’s important and what’s not. Instead of the forest, all you see is trees. This is as true in practice as it is in university, but I benefit from something you don’t: a cashflow incentive. I have no choice but to keep a lid on the time I spend on a project because otherwise my expenses outweigh my income at the end of the month and I don’t eat. Your entire manifesto for life need not find its way into this project. Hopefully, this is but one of many: you’ll have plenty of opportunities to test out other ideas in the future. Forget about the million could-be projects and focus on the one will-be. Making the right design decisions can sometimes feel like a mountainous exercise, but this is the very nature of creation. The more you do it, the more confident you’ll be that you’re right. Embrace the Japanese philosophy of wabi-sabi. It’s a worldview that accepts transience and imperfection, pursuing beauty that is “imperfect, impermanent and incomplete.” In other words, imperfection is actually okay, don’t stress. Test your project on your fellow students. Ask them to tell you what they think is important. You might be surprised to discover that your perfect staircase doesn’t even rate a mention. Tom Cargill quoted in Jon Bentley; Programming Pearls; Communications of the ACM; volume 28, issue 9; 1985. Cargill’s ninety-ninety rule is a riff on the Pareto principle, also known as the eighty-twenty rule i.e. that 80% of the effects come from 20% of the causes. 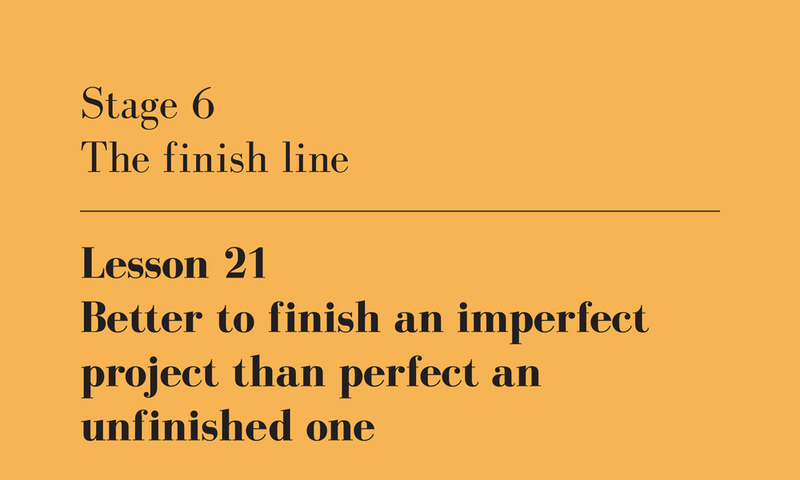 Better to finish an imperfect project than perfect an unfinished one, author’s own image.